Along the way, I picked up an interest in drawing, actually starting with the New Britain CT Art Museum. They held simple art courses on Saturday mornings, and taught some of the basics of drawing. As a young preteen lad, it got me started and doodling became sketches and eventually watercolors and oils. I was never taught the fine points, but did have a love of trying to capture moments - If someone told me that a picture captured that scene and they remembered it, or they were brought back in time - it was worth the effort. To the left is a scene from 29 August 1960. 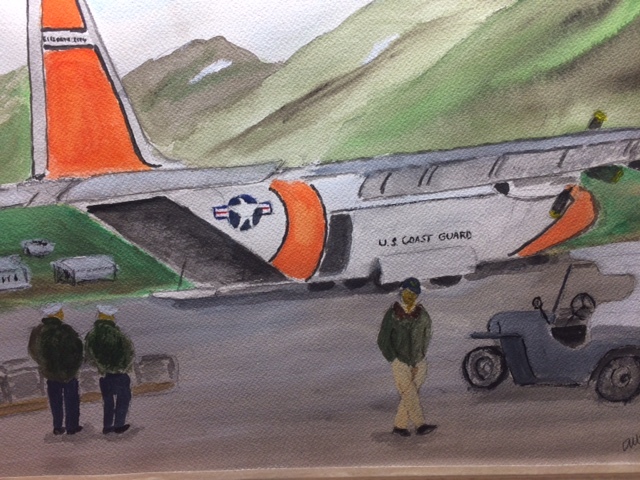 The Coast Guard's first HC-130B CGNR 1339, was used as a VIP transport (with a plush pod) or rushing high priority cargo to our building of the new LORAN-C chain. Here, it is poised after unloading at Attu AK; Classmate and CO of the station, Paul Henneberry in the foreground. 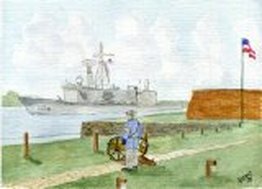 The Navy League Savannah Council President asked me to paint a picture of the USS Underwood on arrival in Savannah. 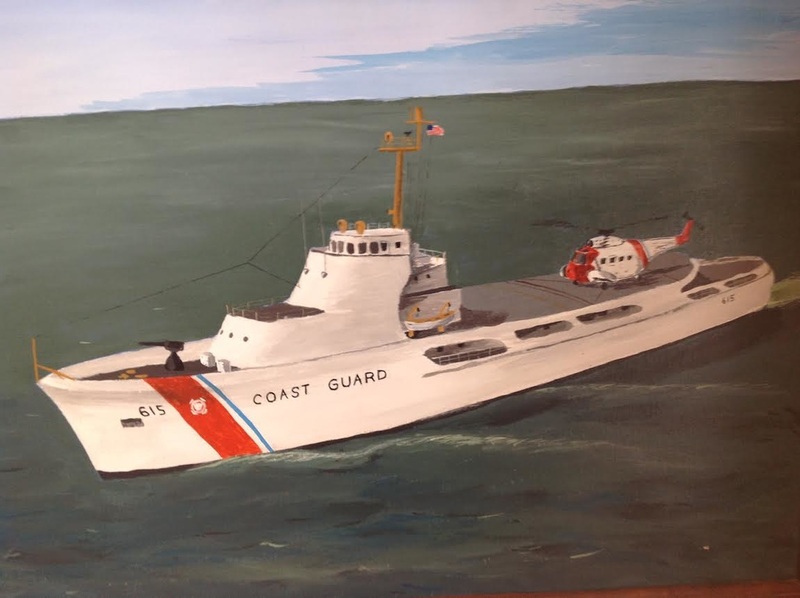 The CO had it ornately framed and hung in the Captain's Cabin where it has remained as the good ship has sailed on numerous missions around the world. The Grumman UF1G begot the UF2G which was redesignated the HU-16E by DoD, It was a mainstay in CG Aviation for many years. 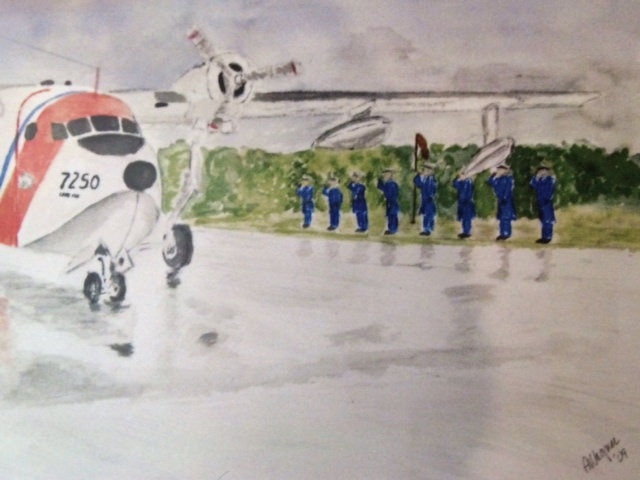 Here, the departure of the last "Goat" from CGAS Cape Cod for AMARC is depicted with the Chiefs showing their respect for the departing dowager. John Redfield and others pioneered the HH-52A operations on our 210 ft medium range cutters. That experience showed a need for 4x4 lumber deck grids to keep the helo from departing over the side, and high tie-down extensions to enable deck crews to rapidly secure the bird.